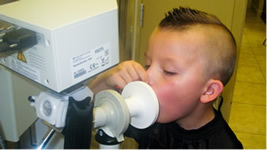 Who Should See Us | Pediatric Pulmonary Specialists, P.A. Who Should See A Pediatric Pulmonologist? 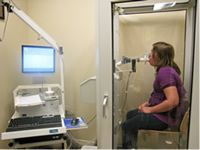 We specialize in providing comprehensive evaluation of a variety of breathing disorders in children. We ONLY provide care to children and adolescents which means we specialize in how these disorders affect children and how to treat them. Children are not just little adults and deserve care specific to them. In children, symptoms are often varied and may be subtle. While the list below is by no means exhaustive, it is meant to give you an idea of some of symptoms that we often deal with. If the answer is yes to any of the questions below, we may be able to help. Cough significantly more than two nights a month. Cough significantly more than two days a week. Use albuterol on a regular basis (weekly or even monthly). Use a daily controller asthma medicine (like Flovent, Singulair, or Advair) and still have symptoms. Cough when he/she runs or exercises. Been admitted to the hospital for an asthma attack more than once. Had more then two courses of oral steroids (prednisone/orapred) for asthma or croup in the past year. Been diagnosed with asthma and you want a second opinion. 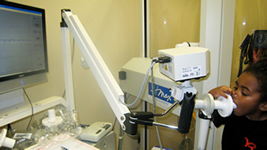 Have chronic or seasonal nasal congestion. Breath fast or seem labored on a frequent basis. Have a hard time gaining weight. Seem to have a lot of respiratory infections (viral or bacterial). Always seem to have noisy/raspy/rattling breathing. Have a hard time staying awake during the day or seem “overly” hyperactive. Been diagnosed with pneumonia more than once. Have a question of chest wall deformity or pectus excavatum. Make a funny noise when he/she breathes in or out. Seem to stop/pause in breathing while awake or asleep. Have sickle cell disease and breathing problems/asthma. Have a history of being born early. Have cystic fibrosis or you were told they had a positive newborn screen for cystic fibrosis. Have neuromuscular weakness or spasticity and seem to cough a lot or has had pneumonia. We are here to provide the specialized care your child or adolescent deserves.